Scoliosis - body, causes, What Is Scoliosis? Scoliosis (sko-lee-O-sis) is a lateral, or side-to-side, curvature of the spine that most often occurs gradually during childhood or adolescence. The name "scoliosis" comes from the Greek word meaning curvature. Everyone's backbone curves to some degree from front to back, which is necessary for proper movement and walking. In scoliosis, however, the spine curves in a side-to-side direction too, or the curve may be S-shaped when another part of the spine develops a counterbalancing secondary curve. Depending on the degree of curvature, this may cause other physical problems, such as pain and breathing difficulties. The parts of the spine most commonly involved are the thoracic (tho-RAS-ik), or chest region, and the lumbar (LUM-bar), or lower back region. Scoliosis is a fairly common condition. It has been estimated that about 3 out of every 100 people have this disorder to some degree. Girls are about 5 times more likely than boys to develop scoliosis. The most common form of scoliosis is called idiopathic (id-ee-o-PATH-ik), which means that the cause is unknown. Usually, scoliosis becomes apparent just prior to or during adolescence, when the body's rate of growth speeds up markedly. The curvature stops increasing after people have reached their mature height. Rarely, scoliosis is a congenital (present at birth) abnormality of the vertebrae (VER-te-bray), or spinal bones, and continues to develop throughout childhood. 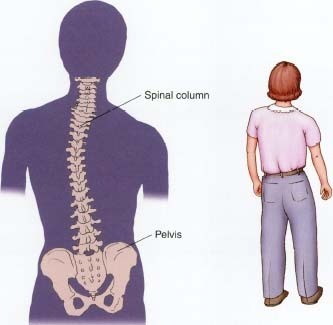 Poliomyelitis (po-le-o-my-e-LY-tis) has caused scoliosis in some people by paralyzing or weakening the spinal muscles on one side of the body. Occasionally, an injury such as a disk prolapse (slipped disk) or a sprained ligament * in the backbone can cause temporary scoliosis. When this happens, the curvature may be accompanied by back pain and sciatica * . People who have scoliosis often have family members with the same condition. This suggests that heredity also is a causal factor in some cases of scoliosis. Because scoliosis can develop very gradually, there may be no observed signs or symptoms in its early stages. Often, the curvature is first noticed in a teenager indirectly: one shoulder may become noticeably higher than the other, or a dress or jacket may not hang straight. Early symptoms of scoliosis may include an unusually tired or achy feeling in the lower back after standing or sitting for a long time. * ligament (LIG-a-ment) is a fibrous band of tissue that connects bones or cartilages (CAR-ti-lij-ez), serving to support or strengthen joints. * sciatica (sy-AT-i-ka) is pain along the course of either of the sciatic (sy-AT-ik) nerves, which run through the pelvis and down the backs of the thighs. For some, the curvature eventually may become more severe and easier to recognize. Severe scoliosis can cause chronic * back pain. If the curvature exceeds an angle of about 40 or 45 degrees, it can interfere with breathing and affect heart function. How Do Doctors Diagnose and Treat Scoliosis? Scoliosis is not always easy to diagnose, especially if it does not hurt or have visible signs. A physical examination of the spine, hips, and legs is the first step, followed by an x-ray if needed. In the United States, public schools often do a simple test for scoliosis called the forward-bending test. The school nurse or another staff member has students bend over parallel to the floor with their shirts off to check for curvature. If scoliosis is suspected, the student is referred to a family doctor for further evaluation. The doctor might want to have an x-ray taken for a clearer view of the spine. The severity of scoliosis is diagnosed by determining the extent of curvature of the spine. The curvature is the angle of slant of the spinal bones measured in degrees. If the cause of scoliosis is known, such as an injury or unequal leg length, the treatment is designed to address the cause. For example, wearing a shoe with a raised heel can correct scoliosis caused by unequal leg length. In idiopathic scoliosis, however, the choice of treatment depends largely on the severity of the condition. If the angle of curvature is slight (say, 10 to 15 degrees) nothing may need to be done other than having regular checkups to make sure the curvature does not worsen. Somewhat greater curvature can be treated by wearing any of several types of back braces. An angle of curvature of 40 degrees or more may mean that a corrective operation will be needed. Fortunately, much of the deformity of scoliosis can be prevented if the condition is detected early. In most instances, no lifestyle changes are needed, and people can carry on with their normal activities. A hundred years ago, teenagers who had to wear back braces for scoliosis faced some very uncomfortable choices. As if being tortured, they were strapped to racks in an attempt to straighten their backs. Later on, metal jackets that weighed up to 30 pounds were worn to try to reduce the curvature. Lighter jackets, made of plaster of paris, came next, but often they were hot and itchy. Today's back braces are big improvements. Many are made of lightweight materials and do not have to be worn all the time. There are several different types to choose from to suit the teenager's particular requirements. Some are worn only while sleeping; others can be worn under clothing, so that they are not visible. Still others are of a low-profile type that comes up underthe arms and are quite comfortable. Wearing a back brace sometimes causes emotional problems. Some teenagers may resist the idea of wearing a back brace, because they fear their friends or classmates may reject or ridicule them. Counseling or support groups often are helpful in sharing experiences and problems and should be considered as part of the treatment. Tomorrow's back braces undoubtedly will be even more adaptable, as medical engineers are constantly making improvements. The National Institute of Arthritis and Musculoskeletal and Skin Diseases (NIAMS), part of the U.S. National Institutes of Health (NIH), posts information about scoliosis on its website. The Nemours Foundation posts a fact sheet about scoliosis at its website. The Southern California Orthopedic Institute also has a helpful website.